For the 2010 IUAES Inter-Congress in Antalya, Turkey. This paper employs a visual sociological approach to better connect the ordinary practices of the people who live, shop, or simply travel along a commercial thoroughfare, Coney island Avenue, in Brooklyn, New York to the often too abstract theories of globalization and multiculturalism that purport to explain what it is they are doing. Toward this end, the author offers demographic data, urban journalism, and a small sample of 16 photographs selected from 550 taken with a digital camera while riding the B 68 bus along Coney Island Avenue as a re-presentation of a quotidian multicultural panorama. It concludes with a selective review of some pertinent theories about diversity in urban life. As a result of the global circulation of people and cultures, urban neighborhoods in global cities are increasingly diverse. In the social spaces of these neighborhoods, cultural strangers must negotiate the various forms of quotidian interaction. Simmel famously noted the importance of ‘visual impressions’ in making sense of the urban environment. Using spatial semiotics,one can investigate the ways in which urban spaces are both the context of and product of ethnic and class transformations. Starting with a phenomenological insight, that people change the meaning of social spaces by changing how the spaces look, one can develop an interpretation of visual markers that reveal the visual basis of multicultural, multiethnic neighborhoods. 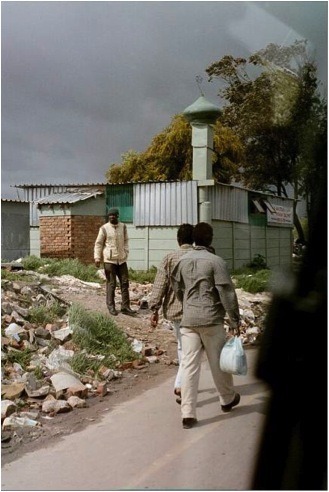 Photo: Mosque in Cape Town, 2000. By Jerome Krase.